The first book to demonstrate how today’s “Dialogue of the Deaf” between the Left and Right wing has generated full-stop policy gridlock in Washington—and how to put an end to today’s Left/Right shouting match. The first book to delve deeply into the issue of “fair shares” or Distributive Justice. The first book to deal with the prospect of national bankruptcy due to future health-care spending. 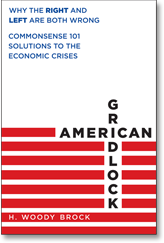 The first book to argue that political science and political theory are more fundamental than economics. 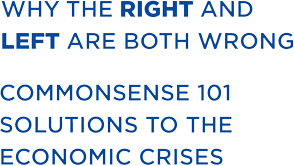 Why are both the Right and Left wrong in their analysis and proposed solutions to our economic problems? Can you elaborate on your definition of a “good” and “bad” government spending deficit? What is your solution to the health care spending crisis? Can we preserve capitalistic incentives, while avoiding massive income disparities and providing assistance to those who are truly in need?